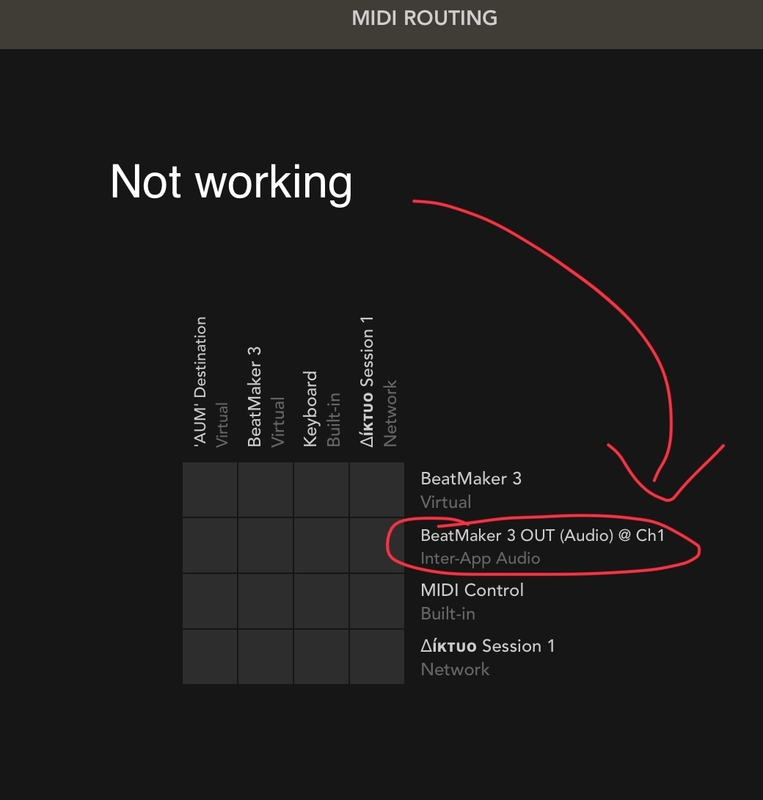 BeatMaker 3 build-in midi port input not working? Saw a post on AB forums which reminded me that BM3’s midi port doesn’t seem to work & cant choose it as a midi source for a Bank. Am I missing something or it’s a bug ? What exactly are you trying to do, your question makes little sense, Beatmaker once had a MIDI port named Beatmaker visible, this was a bug and was rectified a long long time ago, all the ports in Beatmaker now work perfectly. Moving this to general, its not a bug. Make BM3 listen to BM3’s build in midi port . There is a visible BeatMaker 3 midi port in BM3 settings and other hosts see that port . No option for choosing BM3 port in Bank midi input setting , user must enable ‘ALL’ ports . I call it a bug , others may call it missing feature . Not working inside AB3 (BM3 midi input port) . Tested on AUM . Figured it out . IAA midi port ,not working . Fortunately virtual port is working ,but that means no AB3 midi . And any combination of the three above. This pretty much covers every type of combination of possible MIDI input in to Beatmaker, so no, not a bug. I am talking about connecting a host to BeatMaker 3. So controlling B3 from a host, like i did in my Cubasis video ? 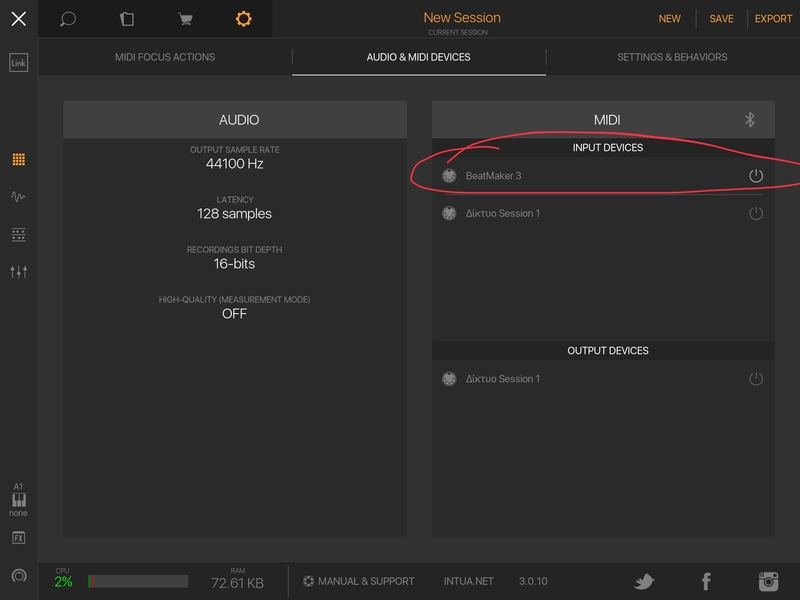 For starters, you seem to be trying to get a MIDI output from an external host without that external host even running, or the external hosts MIDI output would be shown in B3s input list. Someone else can conment on IAA MIDI, while i know it has been used by many people since B3s release, I personally wouldn't use IAA if you paid me. Good luck, i cant help you further. A MIDI input in what @denx ? Do you mean as a MIDI receiver in Audiobus or that it shows up in inputs in B3 itself ? If it is the latter, I have no idea, it was mentioned in earlier builds as a bug when B3 was listed as a MIDI output too. The output was removed (Which never actually worked by the way, it was a bug) however the input remained. It is possible it is a global input or possibly the start of a new feature or something (Ab3 Receiver ? Input ports just for Omni mode ?? MIDI Feedback ???) because even though people think this input doesn't work, it actually does, but it works in a strange way. Enable the Beatmaker 3 input in B3, go to something like Cubasis and send MIDI via that Beatmaker 3 output, now try to assign that MIDI input to a bank or pad in B3 using their respective MIDI input settings, that input isnt available, right ? Wrong, put it on 'All' and it will receive the MIDI, even though that input isn't listed lol. So with the combination of the rogue MIDI output being removed when input and output were reported as bugs, plus the fact the output never even worked, but as can be seen the input does work, albeit in a strange way, we have to assume it was left there for a reason. But to shut up and answer your question, no idea what it is for hahaha. An unused midi port named BM3 is shown as input in BM3. Fortunately not in Banks ,but in midi preferences. Inside AB3 ,there are way too many ,unknown AB3 midi related destinations when loading AU midi plugin in AB3 . This is not only BM3 virtual midi port, for me any virtual port from any application such as ModStep, apeMatrix, are not receive by BM3. 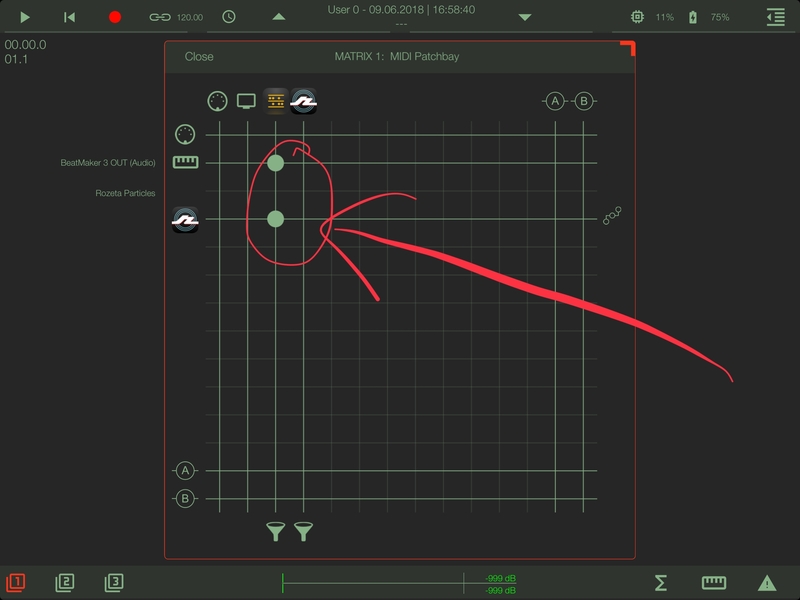 apeMatrix doesn’t have virtual midi port , don’t have Modstep installed . Update : it works ,plz ignore this post . MidiFire can log midi datas, but as Beatmaker is not receiving any datas, MidiFire log is irrelevant no? Sorry , didn’t have much time to update my previous comment. Long story but it works. I created to virtual ports ‘A_in’ , ‘B_out’ , in Midiflow . Launched AUM and load rozeta . Selected ‘A_in’ as destination in AUM’s midi routing panel from Rozeta . Created a route in Midiflow ‘A_ in’ to ‘B_out’ . Launched BM3, enabled ‘B_out’ as input (midi from the output). Enabled ‘B_out’ in Bank’s midi preferences. If you try to send to BM3 port, only the virtual port works ,not the IAA midi port. Of course you have to enable BM3 port as input inside BM3 preferences and set the Bank to listen to all ports (pita) . This has always been the case as far as I remember. 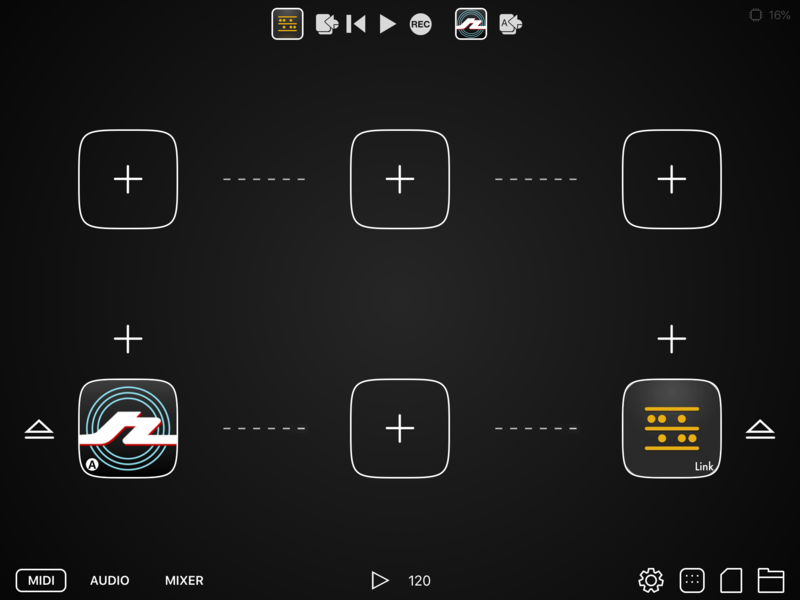 IAA and AudioBus midi input has never worked for me, only CoreMidi. I wish this one would get resolved.